Luigi Boccherini (1743-1805) was born in the town of Lucca in northern Italy. He studied cello and became a virtuoso. But it was at a time that such players could not yet make a living from touring, so Boccherini found jobs in various orchestras in Vienna and Italy. 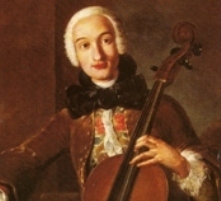 Boccherini eventually moved to Paris where he hoped to establish himself as an independent soloist and composer but could not and was forced to take employment with the Spanish royal family for the rest of his life. The cello being his own instrument, it is not surprising to learn that Boccherini composed over 30 sonatas for cello and basso continuo. But the best known of all of these works are the six published first in London by Bremner in 1771. However, all subsequent editions, starting in the mid 19th century have realized the keyboard part so that it could be performed by the modern piano. Sonata No.3 in G.5 Major opens with a Largo which ends with a short cadenza. The second movement is marked Allegro alla militaire which aptly describes the martial quality of the music which is created by the drum-like rhythm. As was typical for the time, Boccherini ends with a Menuetto which provides a fine contrast.